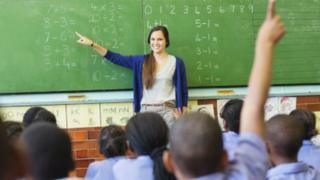 Maths, science and language teachers in England have high rates of leaving the profession, particularly in their first five years, a study finds. About one in 10 of those teaching these subjects, as well as technology, leaves each year, the National Foundation for Educational Research (NFER) says. The NFER analysis of official data covered the period from 2010 to 2015. The government has previously said there are more teachers than ever before in England's schools. These rates were higher than other subjects - for example, 5.9% of PE teachers left each year. Of those teaching arts subjects such as art, drama and music, 8.4% left each year, alongside 8.5% of those teaching humanities such as history and geography. Those teaching core academic subjects were also more likely to move between schools each year. "We found that rates of early career teachers in science, maths and languages leaving the profession are particularly high," the study said. "Rates of teachers leaving the profession are highest in the first few years after qualifying to teach, for teachers of all secondary subjects and for primary school teachers. "This has consistently been the case for at least 15 years. Switching career is easiest when an individual has invested relatively little in a particular career path." The report adds that leaving rates of maths, science and languages teachers are above average in their first five years in the profession. It suggests one of the reasons why teachers with a Stem (science, technology, engineering and maths) background leave could be better job prospects in other industries. The government has previously said that teacher retention figures in England remain steady, with about 70% of those who start teaching still in the classroom five years later. It said it was investing £1.3bn in recruitment and had devised schemes to ensure new teachers stayed in their jobs in areas with a poor record of retaining teachers. In March, Education Secretary Justine Greening acknowledged there were challenges and said she wanted to work with the profession to work out what the issues were at a local level. "We know that schools in different circumstances face different problems, and that's part of the difficulty in fixing this," she said. "Some of it is to do with the geography, some of it's to do with the subject, some of it's to do with the school. So there's no one-size-fits-all answer." In February, the Education Select Committee said the government was failing to take adequate measures to tackle "significant teacher shortages" in England. The MPs called for a long-term plan, saying schools were struggling to recruit enough teachers and pupil numbers were continuing to rise.